Music fans can get pretty hung up on constructing taxonomies – making connections between artists, giving a name to every genre and sub-genre, and fitting everyone neatly into their boxes. Bookshelves groan under the weight of literature telling the story of popular music through the prism of scenes (be it Merseybeat, Brill Building, Chicago blues, Motown, Laurel Canyon, grunge, or whatever). The problem with taking the scene-based approach to pop music history, though, is the tendency to overlook musicians who don’t fit easily into a sonic, chronological or geographical category. They get forgotten. Take Suzanne Vega – a huge fan of both Lou Reed and Leonard Cohen, whose first recordings were released through Jack Hardy’s Fast Folk magazine, also a vehicle for the much more obviously rootsy likes of Lyle Lovett, John Gorka and Shawn Colvin (all were regulars at Hardy’s Greenwich Village Songwriter’s Exchange). Vega’s early work was produced by Patti Smith’s guitarist Lenny Kaye, and her later, more electronic work would see garner her US Modern Rock hits (number ones, even, in the case of Blood Makes Noise), yet she has always been an essentially mainstream figure, one whom my grandparents recognised and approved of. It’s a strange space she occupies, or so many spaces that she ends up in a sort of non-space. Her famous early recordings aren’t much help as we try to work out what kind of music we’re listening to. There’s something a little prissy about Small Blue Thing and Marlene on the Wall, in both sonics and arrangement, that doesn’t sound alt. or indie; the Suzanne-in-a-cavern reverb of Small Blue Thing, meanwhile, immediately dates the recording to the mid-eighties, and tells us we’re not listening to a straightforward folksinger record, which typically are recorded and mixed drier, closer and more intimate. Things become a little clearer on Solitude Standing, Vega’s second album – the record that gave us Tom’s Diner and her breakthrough hit Luka. Rather like contemporaneous records such as Crowded House’s Don’t Dream it’s Over or Tracy Chapman’s Fast Car, Luka’s sound is inflated a little bigger than it needs to be, and the guitarist’s tone is regrettable (that quacky out-of-phase Strat tone was already a cliché in 1987), but the sensibility of the production isn’t at war with that of the writing on Luka (everyone seems to agree that they’re making pop music, whereas no one seemed really to know on her debut) – and while Stephen Ferrera’s drums are a little on the big side, he delivers a performance that’s just as musical as it is muscular. Ferrera assumes more than just a timekeeping role on Luka. From his opening snare fill, he provides a sort of commentary on the song as it progresses, responding to Vega’s vocal with emphases on the toms, anxious snare fills and cymbal crashes. When the guitarist comes in with his first quacky solo, Ferrera begins to vary his kick drum pattern to provide more lift and propulsion. It’s a clever detail that gives the song a push without actually shifting the tempo. The most notable element of the rhythm track is of course those huge tom hits that are used as punctuation at the end of every second bar in the verses. As Ferrera’s hi-hat maintains steady eighth notes at the same time, and as most drummers who play the song with her live forsake those tom hits,* I guess they were overdubbed. Possibly their being recorded in isolation from the rest of the kit accounts for how huge they are in the mix; they make a pretty mighty thud. Either way, they’re really integral to the arrangement; the song always loses something, for me anyway, when I hear a live performance that doesn’t feature them. Ferrera’s ear for detail eventually took him from studio drummer to producer to A&R to record executive. He landed the American Idol franchise for RCA, helping to launch Kelly Clarkson’s recording career, before becoming Senior VP of A&R at Columbia. He died of lung cancer in January 2014. As a drummer, he was the very definition of underrated. *One exception was Anton Fig, when Vega played the song on Letterman. I assume it was Fig, anyway. That performance was 1987, and he joined in 1986, so it’s him unless someone was depping that night. This entry was posted in Music and tagged 1980s, Anton Fig, Blood Makes Noise, Columbia, Crowded House, Don't Dream it's Over, drummers, drumming, Drums, Fast Car, Fast FOlk, Greenwich Village Songwriter's Exchange, Jack Hardy, John Gorka, Lenny Kaye, Leonard Cohen, Letterman, Lou Reed, Luka, Lyle Lovett, Marlene on the Wall, Patti Smith, RCA, Shawn Colvin, Small Blue Thing, Solitude Standing, Stephen Ferrera, Stratocaster, Suzanna Vega, Tracey Chapman, underrated drum tracks, underrated drummers on November 18, 2016 by rossjpalmer. Hi all. I’m in the middle of a busy 2-week period with a lot of work and other things. I can’t imagine posting anything before Sunday night unless I dip into the archive. So here you are. That debut album, released on Verve Folkways, brought her to the attention of David Geffen, then a young wannabe agent on the make. He convinced her to take him on, got her out of her previous business arrangements, set up a publishing company with her and got her signed to Columbia. This was a good place for her to be. Columbia had great studios, some of the best producers and engineers (Charlie Calello, Roy Halee and Arif Mardin), and access to the kind of funds needed to hire the best musicians in town to play her idiosyncratic, irregular music: Chuck Rainey, Hugh McCracken, Richard Davis, Alice Coltrane and even Duane Allman are just a few of the musicians who played on her trio of classic albums from the late sixties and early seventies, Eli & the Thirteenth Confession, New York Tendaberry and Christmas & the Beads of Sweat. All of these albums are essential. My favourite is probably New York Tendaberry, which has fewer famous songs than the other two, but is a richer, more elusive and ultimately more rewarding album qua album. Eli is where you go for standout songs and, truth to tell, a little filler (but those highlights include Emmie, Lu, Eli’s Coming, Stoned Soul Picnic so who’s grousing?). Christmas and the Beads of Sweat, the last of her three great albums, is something else again. The most diverse and in some ways the most difficult of the classic trio, lacking as it does the unifying themes and mood of New York Tendaberry and the sheer volume of transcendent melodies on Eli, Christmas wrong-foots you by throwing in songs like When I Was a Freeport and You Were the Main Drag and her transcendent version of Up on the Roof in among all the difficult stuff. Songs like Map to the Treasure are commendably ambitious in musical form, but lack the assuredness of the similarly complex material on New York Tendaberry (Gibsom Street, say) or the lightness of touch present on Eli. But When I Was a Freeport is a no-arguments career highlight. It’s a slight return to the style of her debut album, albeit one with a wiser, more adult lyrical sensibility. Lines don’t come much better than “I’ve got a lot of patience, baby, and that’s a lot of patience to lose”, and I never fail to smile at the “Whew” she inserts before the last (very Dylanesqe) “drag-uh”. It’s a mystery to me why she didn’t end the album with this song – no ending to the first stage of her career could have been more fitting. This entry was posted in Music and tagged Alice Coltrane, And When I Die, Arif Mardin, Billy's Blues, Bob Dylan, Charlie Calello, Chuck Rainey, Columbia, David Geffen, Duane Allman, Eli's Coming, Emmie, Gibsom Street, Hugh MaCracken, Laura Nyro, Lu, Map to the Treasure, More Than a New Discovery, New York Tendaberry, Richard Davis., Stoned Soul Picnic, Stoney End, Up on the Roof, Verve Folkways, Wedding Bell Blues, When I Was a Freeport & You were the Main Drag on March 16, 2016 by rossjpalmer. I’ve discussed before the move from damped, dead drum sounds to ambient, live drum sounds that occurred in the late 1970s and early 1980s in the context of records by Stevie Nicks and Bruce Springsteen. But those artists were relative minnows in the big bam boom game compared to the king of gigantosaur drums: Phil Collins. But of course you know this, and you may well also know the name of the technique used to create these sounds. Gated reverb was one of the key defining sounds of 1980s rock and pop. It was a solution to a very particular problem. If you record a drum kit in a big room, the whole drum kit gets big, with long decays that muddy and confuse the sound; the faster and more complex the material, the less suited it would then be for heavy reverb. But what if you could apply this heavy reverb in small doses, snap it quickly on and off to give that snare drum a quick but controlled burst of power? That’s precisely the solution that Hugh Padgham at the Townhouse and, independently, the team at Tony Bongiovi’s Power Station in New York arrived at. Use the close snare mic to trigger a noise gate strapped across a pair of room mics so the huge reverb is applied for, say, a few hundred milliseconds, and then snapped off. If you’re trying to remember what that sounds like, think Let’s Dance (produced by Nile Rogers at the Power Station), think Some Like it Hot (by the Power Station, the other one), think China in Your Hand. Think Wings by HAERTS. HAERTS are a New York synth-poppy rock band on Columbia. Their debut album has just come out, but it’s been percolating for a while. Wings itself came out in 2012, a debut EP came out last year and the album, HAERTS, has just come out. Yeah, the misspelling and the capital letters are annoying (and from now on, I’m going to drop the all caps). So they’re not off to a great start there. Not to be cynical, but Haerts seem to me to be an attempt by Columbia to achieve what Polydor has with Haim: same slow drip of material over a couple of years to build a base on college radio (KEXP Seattle has been behind them since the start), similar sounds and influences, taken a step of two further, even an all-capped stylised name. This is the thing. Production fashions are an arms race. This is how it happened last time gated reverb was the thing. One artist does something, the next one repeats it but takes it further, everyone piles in until a point is reached where someone says, OK, enough, and sets their own trend. There’s some gated reverb on the drums on Days are Gone. Noticeably so, but tastefully so. There are some percussion tracks overdubbed over the backbone drum track — as in, say, the later choruses of Falling — which recall Some Like it Hot. There’s quite a lot of semi-clean palm-muted guitar. Haim, or their producer Ariel Rechtshaid, are expert ’80s glory-moment spotters. To take Falling again, when the song breaks down to a chant of “Never look back, never give up” over handclaps, who’s thinking of Wanna Be Starting Something’s famous “mama-say mama-sa mama-ko-sa” chant section? At least some of us, I’m sure. There’s an attention to detail here: the references aren’t hidden, but they’re not sledgehammer obvious either. If you’re not familiar, they’ll slide right by. Wings, the aforementioned Haerts single (above), is much less coy about letting you know where it’s coming from. It’s all there in the 4-bar intro of unaccompanied, huge, gated-reverb drums. It’s an extraordinarily confident place to start your debut single from, but the band do have the advantage of knowing that this sound connected with a big audience relatively recently. That being so, why not give them more of the same, but bigger, and louder? Now, I don’t want to sound too cynical. I like the song. At least, I like the groove, and I admire the construction (for which a lot of credit must surely go to the producer St Lucia, Jean-Philip Grobler). For a record that feels a little like it’s been precision tooled to work in the space created by the success of Days are Gone, it remains a likeable piece of work. The weird thing for me is hearing the soundworld of T’Pau and early Til Tuesday recreated so painstakingly and then seeing it marketed as indie rock. I genuinely don’t know – do the folks younger than me who are into this remember the stuff that it is emulating? Was it still on the radio in the late 1990s and early 2000s? When I was a teenager in the mid-1990s, listening to contemporary rock music and forming my own tastes and preferences, nothing could have sounded older, more tasteless or garish to me than a big, gated-reverb drum sound. It was the preserve of poodle-haired corporate metal bands. Later on when I’d grown up a bit, I had to train myself to put those objections aside, to listen past the obvious signifiers and give the music a fair hearing. But nevertheless, my tastes were formed in the era they were formed in, and despite this being the sound of the popular music of my childhood, it’s not my sound. Perhaps the folks making these records are too young to have these hang-ups. I fear a gated-reverb arms race is underway, which means the next few years are going to be pretty painful for this Steely Dan and Fleetwood Mac fan. 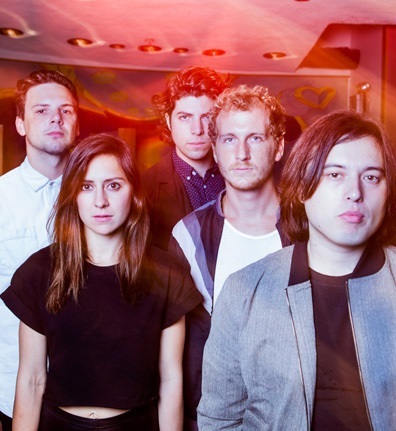 HAERTS – hi there, suspiciously old-lookin’ dude second from right! This entry was posted in Gear, Music and tagged Ariel Rechtshaid, Bruce Springsteen, China in Your Hand, Columbia, Days are Gone, drum sounds, Falling, Fleetwood Mac, gated reverb, Haerts, HAIM, Hugh Padgham, Jean-Philip Grobler, KEXP, Let's Dance, Michael Jackson, Nile Rogers, Phil Collins, Polydor, Power Station, record production, Some Like it Hot, St Lucia, Steely Dan, Stevie Nicks, The Power Station, Thriller, Til Tuesday, Townhouse, Wanna Be Starting Something, Wings on November 1, 2014 by rossjpalmer. The Freewheelin’ Bob Dylan is fifty years old. May 1963. That’s a hell of a thing. In the next ten years, a lot of my favourite records are going to hit that milestone. That’s a hell of a thing, too, one I’m having a little trouble processing. So what does Freewheelin’ sound like, fifty years on, on a Saturday morning, in England? It’s one of those records where my relationship with it has grown more complicated over the years. The first two Dylan records I bought (as an 18 year old, I think) were Freewheelin‘ and Before the Flood (which seemed like a good way to hear a bunch of Dylan’s most famous songs and get to know the music of the Band, too – good plan in theory, but fortunately I gave the Band another chance). Before the Flood sounded flat, uninspired, lacking in power for a record of a tour famed for its energy and force. Freewheelin’, in contrast, seemed marvellous – witty, playful, heavy, alive. It still seems like that, in places. Sometimes. The standout songs on Freewheelin’ – Blowing in the Wind, Girl from the North Country, Masters of War, A hard rain’s a-gonna fall, Don’t Think Twice, it’s All Right – are so much a part of our culture that it’s been a good few years since I sought any of them out to listen to (more than a decade, probably). That leaves us with the rest: the Down the Highways, the I Shall be Frees, and the Honey, Just Allow Me One More Chances. They’re less impressive, and this is where things get more complicated. ‘Authenticity’ in music is itself a tricky notion, one I have less time for with each year that passes. But a sensibility that looks for and delights in ‘the authentic’ can be nuanced rather than boneheadedly literal, and it’s not correct to think that the listener that pursues the ‘authentic’ requires their artists to simply do the same thing over and over. Artists – singers, songwriters, especially bands (since they are a blend of evolving personalities and tastes and sensibilities) – contain multitudes, and their creativity is not going to be one-dimensional. Most listeners get that. Listening to these songs, one is continually brought up short when Dylan’s folksinger drag act makes itself too obvious: on each repeat of the line ‘Honey just allow me one more chance’, at the sound of his out-of-tune guitar (what you saying, Bob – real cowboys don’t tune up first?) on Down the Highway, on the vowel sounds of the high notes on Masters of War (‘…build the death planes‘), the studied folksy archaisms and rusticisms (‘it’s a hard rain’s a-gonna fall’, ‘if’n you don’t know by now’, ‘the light I never knowed’ – and just how many roosters crow at the break of dawn in the Village?). It’s a canny impression, but its falseness slowly dawns on the listener, and once it’s rumbled, it’s hard to hear these songs the same way again. Dylan himself got sick of playing this character, sick of the demands of his folk audience, and so perhaps the skeletal, big-haired, absurdist speed freak – dandified and somewhat camp – character of the Bringing it All Back Home–Highway 61–Blonde on Blonde period was more true to the real Dylan. Or perhaps he’s simply a talented actor with a flair for totally immersive performances who’s never given his audience a glimpse of the real him in over fifty years. None of this is to say that Freewheelin’ isn’t an essential listen. It is, with three or four timelessly classic songs, songs that transcend their contradictions (and the phoniness of their performances on this album). But for many, the deliberately rough, ‘protest song’-singing Bob Dylan is the only Dylan they know, an endpoint, a Dylan perpetually marching on Washington with Joan Baez, singing Blowing in the wind or The times they are a-changing. But it’s truer to say that this was just the beginning of his journey. It’s worth bearing in mind that he was 21 when he arrived in New York and 23 when he made this record. He was, in other words, a kid – just as full of self-delusion and nonsense as any other kid, unsure of who he was and who he wanted to be, fearful of getting found out, of having to live up to others’ expectations, working more from instinct and hope than experience and knowledge. Freewheelin’ is the first significant staging post in Dylan’s career, which is not to say that his artistic progress was linear with his work improving in quality at every stop on the way. For me Dylan peaked in 1965–66, with several other major mini-peaks thereafter. So while it’s nice to mark the occasion of The Freewheelin’ Bob Dylan’s fiftieth anniversary, I hope for a bigger celebration in a couple of years’ time when it’s the turn of Highway 61 Revisited to reach that milestone. 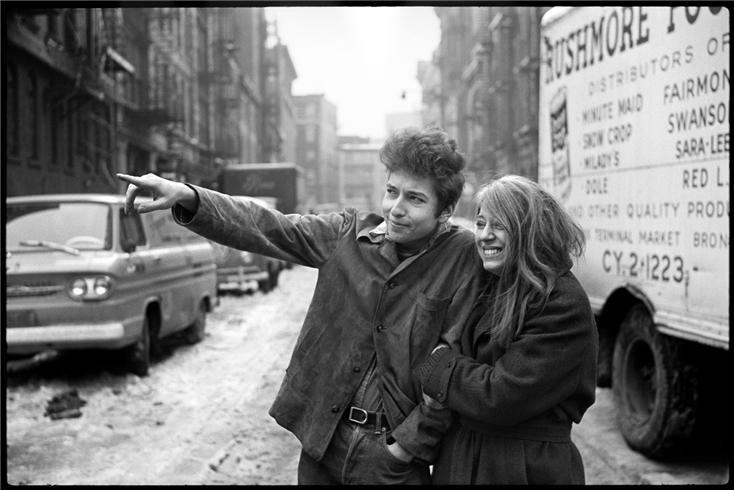 This entry was posted in Music and tagged 50 years old, Blowing in the wind, Bob Dylan, Columbia, folk music, Freewheelin', Joan Baez, The Freewheelin' Bob Dylan on June 1, 2013 by rossjpalmer.